I would like to share how my Winrock International USAID-funded Farmer to Farmer (F2F) volunteer assignment was one of much excitement and full of very rewarding humbling experiences. One experience stands out as a professional one that led to a career culminating experience for me that I would like to share in this blog. The experience deals with my career as an irrigation agronomist/horticulturist of 42 years (1975-2017), which concentrated on “drip irrigation technology” in developed and developing countries. My initial career path in drip irrigation technology started in 1975 with my research at Virginia Tech as a Ph.D. student in the Department of Horticulture doing research on the development and use of drip irrigation on tomatoes in Western Virginia. The drip system that I was using to irrigate the tomato plants with was developed and provided for my research by Mr. Richard Chapin of Chapin Watermatics, considered to be the “Father of Drip Irrigation” in the United States. My drip irrigation career took me to developing drip systems for bananas and pineapples in Honduras, Costa Rica, and Hawaii with Dole Foods, working with commercial drip irrigation vegetable growers in Florida. In addition, I was involved in agricultural development projects with USAID and USDA where drip irrigation for fruit and vegetable growers was emphasized in Pakistan, Afghanistan, Guinea, Senegal, and finally- in Bangladesh. 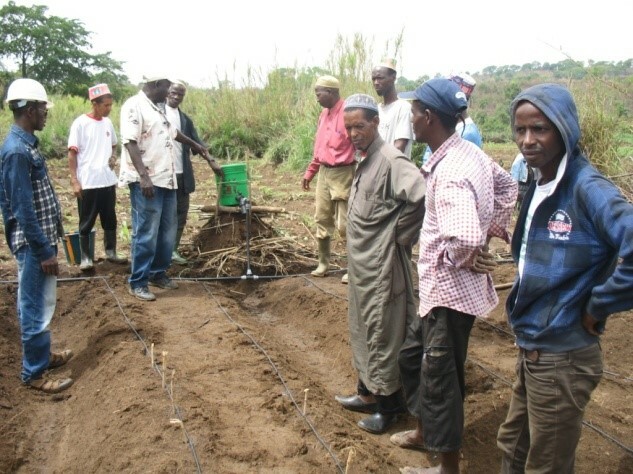 The drip irrigation projects that I was involved in were not all success stories. One in particular failed in 1987 in six months after I departed the country, due to the end of the development project I was serving on. Failure occurred because there was not a dealer network for drip irrigation supplies and technical support. This failure haunted me for a long time. The training experience with Winrock International in March-April 2017 has left me very excited and encouraged about the drip irrigation systems. I used Mr. Chapin’s drip tape that was installed by the Thanarbaid banana growers in the Madhupur Upazila of Tangail District in Bangladesh through the auspices of Shalom (formerly Church of Bangladesh Social Development Programme-CBSDP and their Youth Beneficiary Group). 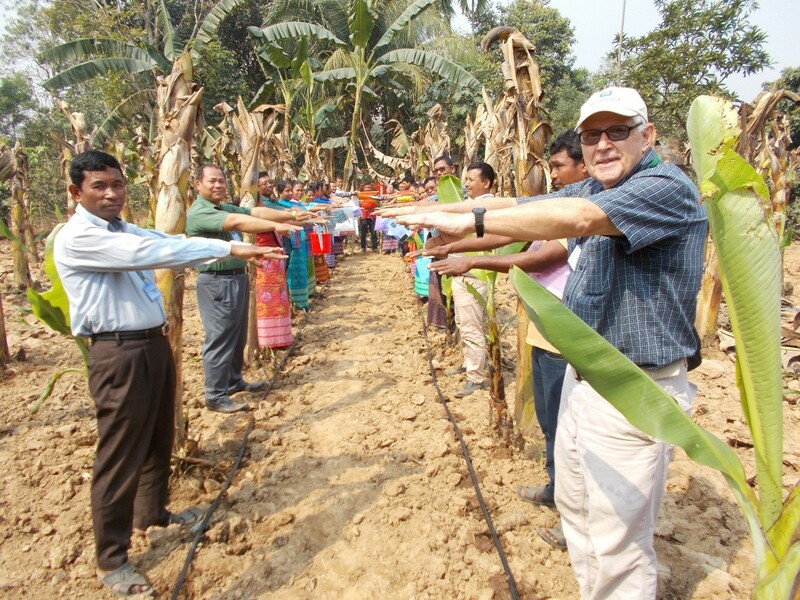 Drip irrigation success in Bangladesh is assured via dedicated banana farmers, Winrock International, USAID, and partner, ACI Agribusiness, who works with Jain Irrigation of India, a key supplier of drip irrigation technology, including Chapin drip tape. 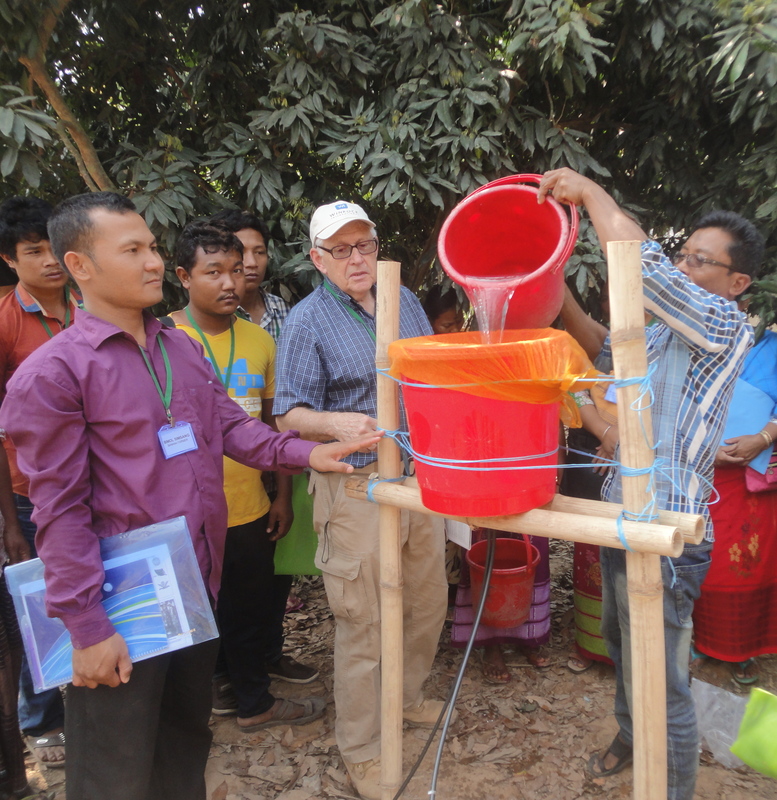 What a rewarding experience it was to culminate my drip irrigation career knowing that drip irrigation technology in Bangladesh will thrive and serve as a food security tool to help feed the people of Bangladesh. Dr. Kovach working with the banana farmers to connect the tubes through the bottom of the bucket to the irrigation tape. 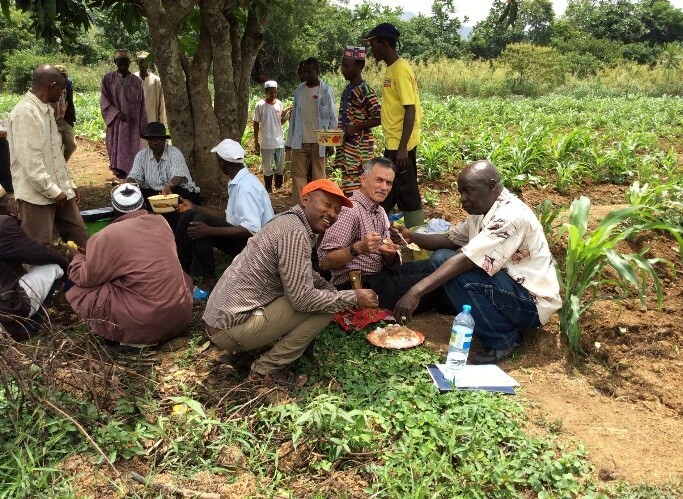 Dr. Kovach with banana farmers over the Chapin Drip Irrigation Tape. Note the dark circles next to the black drip tape where water has come out of the water emitting orifices and began to wet the soil to supply water to the banana plants. 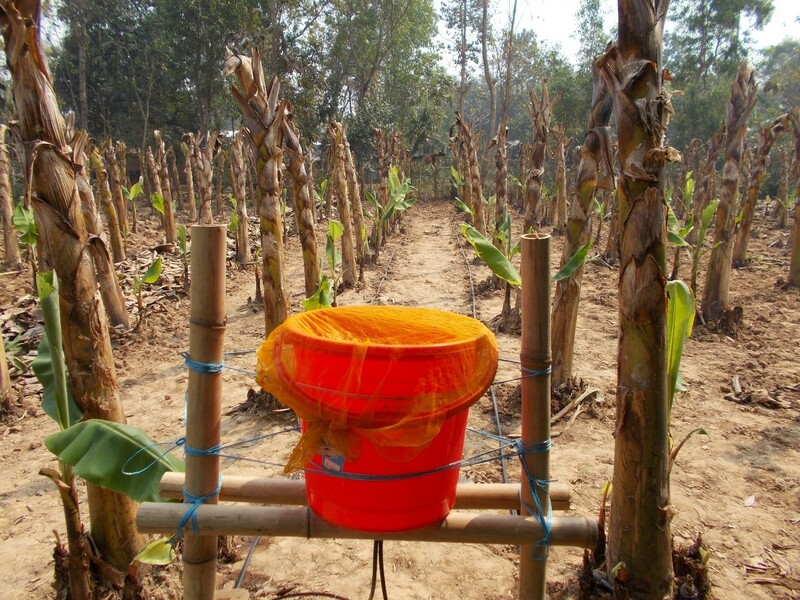 Chapin Bucket Drip Irrigation System supplying water to the two black drip tubes next to the banana plants. The major advantage to using drip irrigation versus the traditional irrigation method of flooding the field is in water savings, where 50% less water is needed to irrigate banana crops. 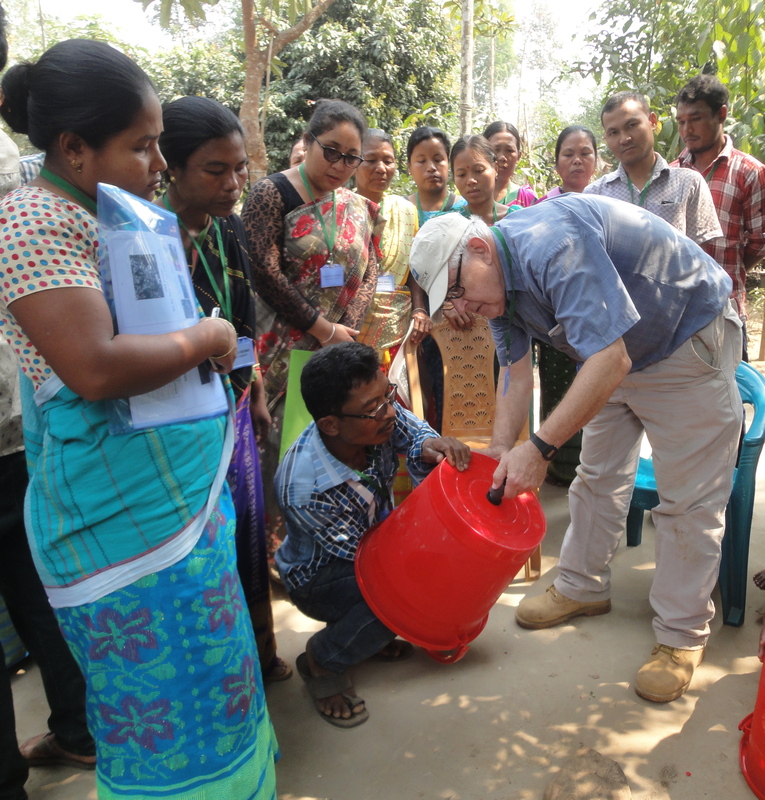 Dr. Kovach observes one of the participants pouring urea mixed water into the buckets to provide plants with water and fertilizer through the Chapin Bucket Drip system in the orchard. 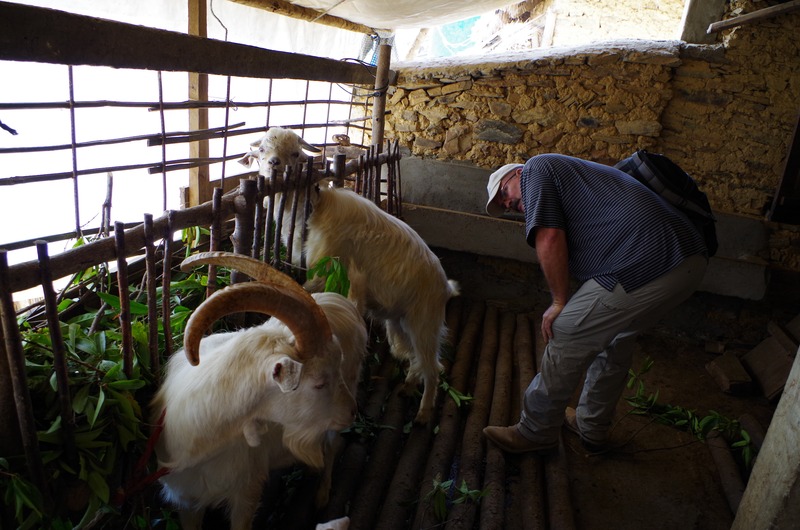 Dr. Foxworth observing Saanen (largest of all the dairy breeds) bucks at a community goat farm. 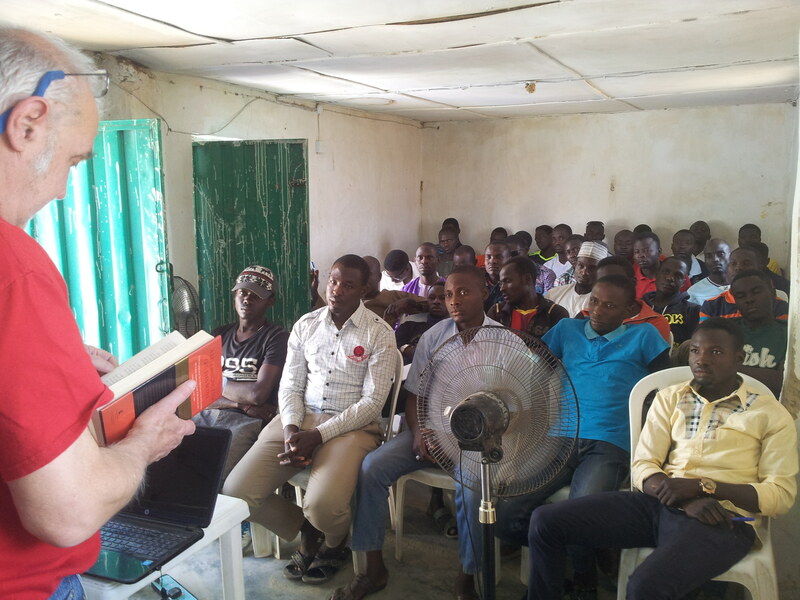 “The training was a major highlight of my service as a Peace Corps volunteer thus far. We spent the first two days of the training visiting some of the model goat farms of Syangja District and getting set up for the training. 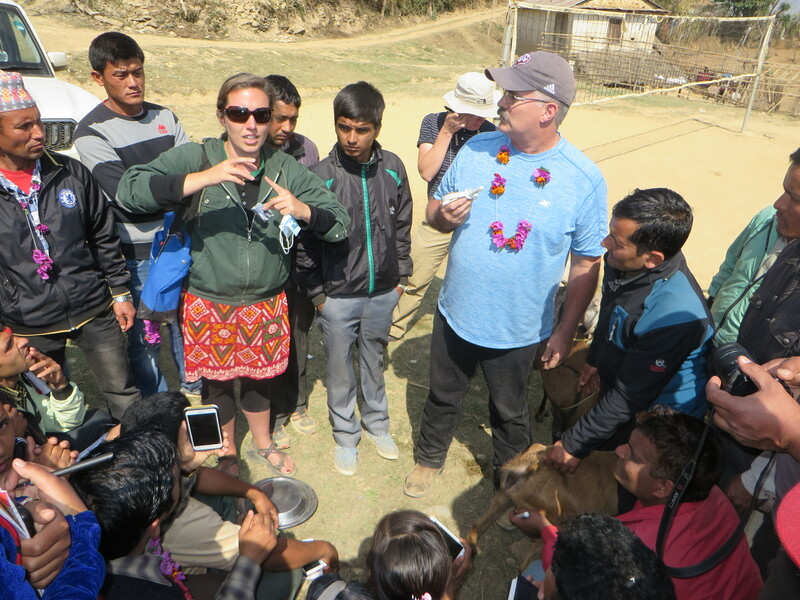 In considering the realities of goat production in a Nepali context, I found that it was immensely helpful to hear Dr. Bill’s reflections from his experience and research in America and around the world, as well as those of Mr. Sushil Aryal, of the District Livestock Service Office Syangja District. “Once we got started with the presentation in Okadi, I found that I was in a unique position to help Dr. Bill with Nepali translation and to help situate the information that Dr. Bill provided within the Nepali context. Because I was already familiar with a lot of the scientific information and technologies that Dr. Bill described, and because I had a sense of what would be familiar and what would be new for the participants, I was able to translate the information in a way that would be accessible and easy to understand, with help from Sushil ji and Dawa Tshiring Tamang of the Agricultural and Forestry University in Chitwan. By the end of the first day of training Dr. Bill, Sushil ji, Dawa ji, and I had developed a rapport that allowed the presentation and subsequent translation to flow efficiently, and be dynamic enough to hold the participants’ interest and attention over the course of the classroom sessions. During the practical sessions, I was able to help Dr. Bill by translating his communications with Sushil ji, as well as his explanations of the practical components for the participants, and by making sure he had access to what he needed to give the demonstrations. Ms. Mason interpreting Dr. Foxworth’s training on use of a hormone application to assist with synchronization for reproduction. “Attending the training also gave me insight into the technologies that are available and currently in use in Nepal. I live in a comparatively underdeveloped area, and was previously unaware of some of the technologies that are accessible to rural areas of the Western Development Region. Having attended the training, I am excited to strengthen my connection with the Livestock Service Sub-Center at my site, and begin discussions with the District Livestock Office in Kushma about initiating a similar program for my village. Sushil ji, Dawa ji, and Dambar Kumari of the Nepal Agricultural Research Council based in Kathmandu, all expressed their interest in helping to facilitate such a program in Thapathana. Attending the Farmer-to-Farmer training gave me access to professional contacts who will prove invaluable in helping me train my community members, and in strengthening my ability to serve my community. With the help and support of my new professional connections, I am looking forward to bringing the technologies presented at the workshop to my village of Thapathana, Parbat. I am excited to continue to work with them and foster these connections so that other volunteers might be able to take advantage of them as well. Dr. Foxworth and Ms. Mason explaining how to use a vaginal speculum to detect heat signs for reproduction. Our Farmer-to-Farmer office in Nepal continues to keep Peace Corps staff abreast of upcoming volunteer trainings located in their zones of influence to further collaboration and the reach of our technical assistance. Constrained by a lack of resources, public extension services in Nigeria fall far short of the goal of one extension agent for every 800 farmers. In this context, agribusinesses and social enterprises like Babban Gona play a key role in expanding small-scale farmers’ access to training. Babban Gona (“Great Farm” in Hausa), an innovative agricultural franchise. 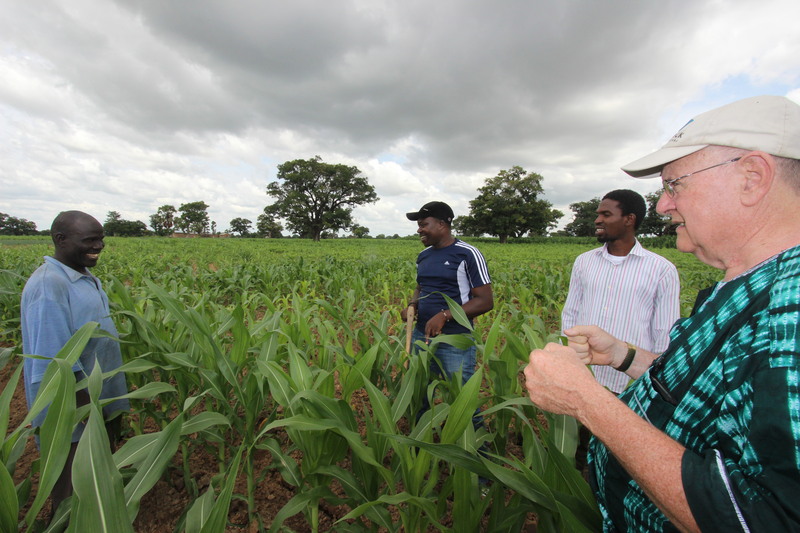 uses an outgrower model, partnering with farmers to increase maize, soybean, and rice production in their own fields. The organization works with groups of smallholders to achieve economies of scale, providing access to low-cost and high-quality inputs and production materials and facilitating marketing of harvests. Babban Gona has built a corps of local extension agents to offer one-on-one support and production advice to over 5,000 farmers. USAID Farmer-to-Farmer volunteer John Moulton worked with Babban Gona to improve its training and extension services. With volunteer support, staff revised their annual trainings and created systems for supporting extension agents. Community extension agents learned to assess farmers’ level of knowledge and training needs. They also created annual work plans with checklists to allow them to monitor their progress. In order to better serve farmers, agents now visit farms on a more regular basis and are available to answer any immediate questions by phone. Babban Gona also started using demonstration plots to share best practices with the broader communities in which their farmers live. Finally, Babban Gona streamlined service delivery by creating special service units responsible for managing distribution and post-harvest processes. The new system is much more convenient for farmers, reducing wait times for inputs and payment. 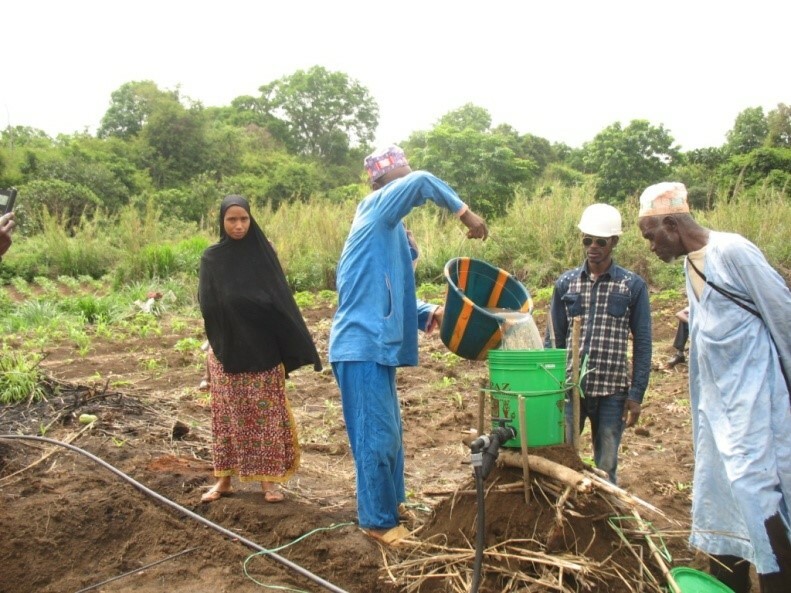 Other volunteer assignments provided support on soil management and marketing techniques. Based on volunteer recommendations, the majority of Babban Gona’s farmers now use crop rotation to maintain soil fertility and prevent damage from crop disease and pests. Extension agents were also taught to work with farmers to identify optimal plant spacing and fertilizer application rates. Farmers have noticed significant benefits, with many able to decrease the amount they spend on fertilizer each year. As a result of F2F assistance, Babban Gona farmers increased yields by 56% (from 3.5 to 4.6 tons) per hectare. “Babban Gona farmers service limited wishes to appreciate Winrock for her diligence and cooperation in ensuring that both Babban Gona staff and member farmers get the best of up-to-date trainings through well-equipped and passionate volunteer trainers who have at several times of assignment given themselves to the training, improvement, and equipment of both our staff and member farmers for increased productivity. Your efforts have yielded great success, as your trainings did not only improve staff knowledge on agriculture but also improved both staff and member farmers development, thereby equipping them to face greater challenges and reducing crime rates to the greatest minimal. Your excellent teaching skills and the admirable personalities of your volunteers has tremendously helped us through our journeys. Team Members were excited to learn new skills for seed production at our last training. The knowledge acquired from the trainings which were introduced into our activities has also provided our organization with the honor of acquiring the 2017 Skoll Award.